I had a fun time climbing the 'cempedak' tree today. The 'cempedak' fruit( artocarpus integer) is very much akin to the jackfruit( artocarpus heterophyllus). There are at least 5 trees that are fruiting profusely at my farm currently. 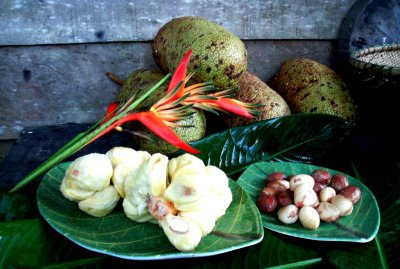 The cempedak fruit is consumed in three main ways. In the above picture, its yellowish flesh which has a soft, custard-like texture can be eaten fresh. It can also be boiled with coconut milk and sugar to make 'dodol'. On the right of the picture, the seeds of the cempedak have been boiled and are ready to be eaten, preferably with honey. In Sarawak and therefore Bintulu for that matter, the fruiting season for cempedak is between the months of November right till February every year.